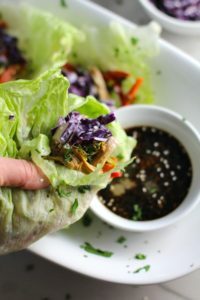 Asian Lettuce Wraps are by far my favorite way to use leftover Turkey or Chicken as it completely transforms it into something new with vibrant and delicious flavors and textures. 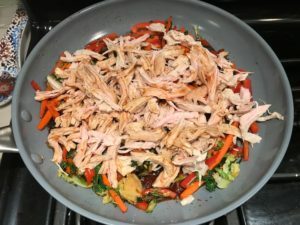 The turkey meat is shredded and then stir fried with carrots, red pepper, and brussel sprouts. 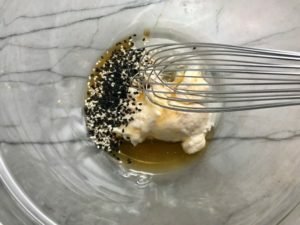 With them is a flavorful ginger, garlic, sesame, honey, and soy sauce. 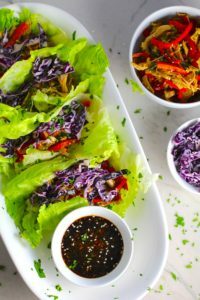 Layer this into lettuce wraps with white rice and a slightly sweet, cool, and crunchy purple cabbage sesame slaw. 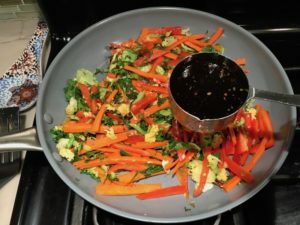 Then, dip it into the addictive Garlic Honey Soy Sauce….YUM!!! 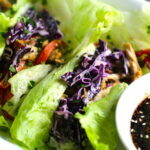 Asian Lettuce Wraps are fun, they are interactive, everyone can make their own and they completely transform the turkey. 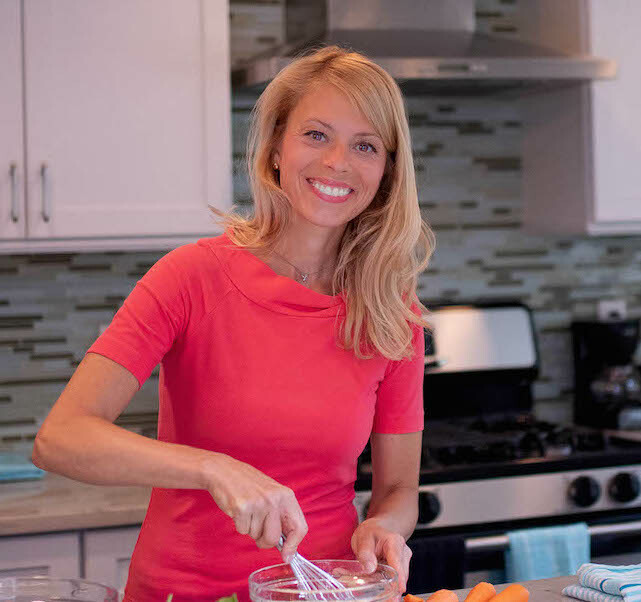 Start by prepping the veggies and the turkey (or chicken). 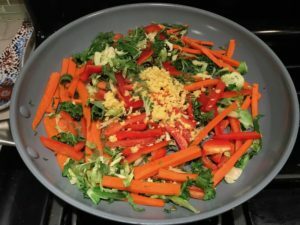 Slice the red pepper and the carrots thin. Slice thin or shred the brussel sprouts. Then mince the garlic and the ginger. Store the carrots and the garlic separate. 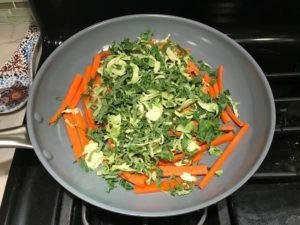 You can store the red pepper, brussel sprouts, and ginger together. Shred the cooked turkey or chicken. Note, use whatever leftovers you have! If you don’t have leftovers, you can buy a rotisserie chicken or simply roast turkey or chicken breast in the oven for 20 minutes in 400 F degrees. Next, clean and gently pull off the outer leaves of the lettuce. You will want 3-4 leaves per person. If the leaves are really large, you can cut them in half. Place in a large bowl lined with damp paper towels. Cover with another damp paper towel and then seal with plastic wrap or a lid. 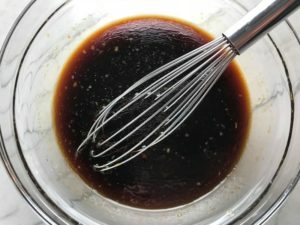 Make the Garlic Soy Marinade and dipping sauce: In a small bowl, whisk 3/4 cup soy sauce, 1/4 cup water, 3 Tbls honey, 2 cloves minced garlic, 1 tsp ground pepper. 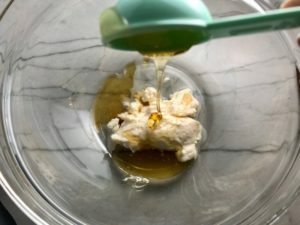 In a large mixing bowl, add the Mayonnaise, Vinegar, Sesame Oil, Honey, and Sesame Seeds. Mix to combine. 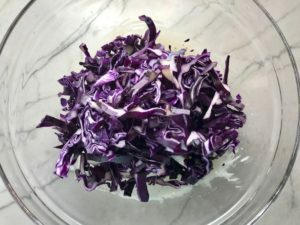 Shred the cabbage and add to the bowl. 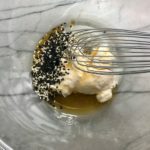 Mix to combine with the dressing and store covered in the fridge. 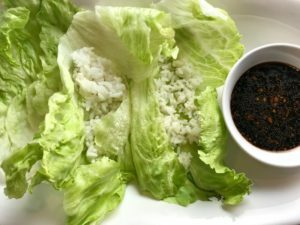 Because I love to make this as a meal, I like to add Rice to the lettuce wraps so they are hearty and filling. And my daughters want rice or pasta in pretty much every meal ;). 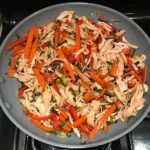 You can use rice noodles or just leave the starch out all together! If you include rice, you will want to just make the rice according to package instructions. Preheat a large skillet on high heat and add extra virgin olive oil to coat surface. 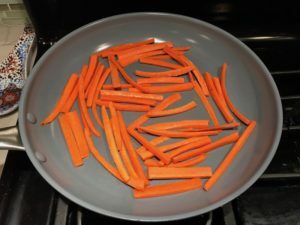 Add the sliced carrots and cook for a few minutes, just so they start to sweat and get soft. Then add the Brussel Sprouts, Red Pepper, and Minced Ginger. 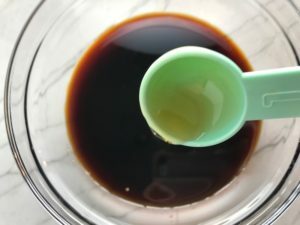 Stir in 1/2 cup of the Garlic Honey Soy Sauce and let cook for 5 minutes stirring every minute or so. Next add the shredded turkey to the pan along with another 1/2 cup of the sauce. 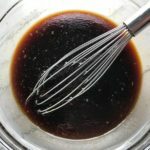 Stir to mix and cook for another 5 minutes until the sauce reduces. 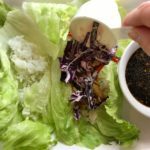 Put the remaining garlic soy sauce into individual dipping bowls and start to assemble the lettuce wraps. 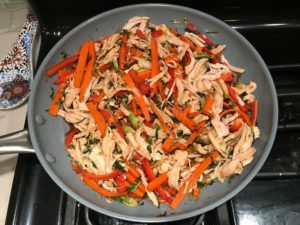 Layer in the rice, then the turkey and vegetable stir fry. 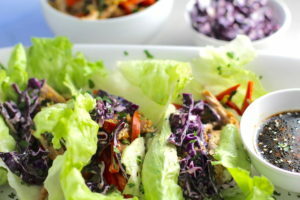 Last top with the cool cabbage slaw. 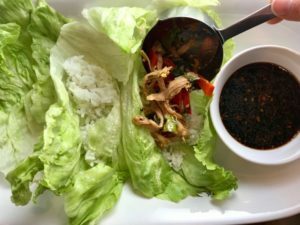 Asian Lettuce Wraps are a fantastic way to use leftover Turkey or Chicken transforming it with new delicious flavors and textures. The turkey is stir fried with carrots, red pepper, and brussel sprouts in a flavorful ginger, garlic, & sesame sauce. 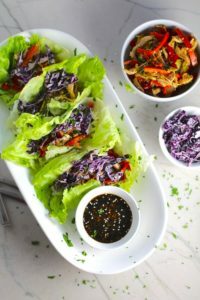 It's layered in lettuce wraps with rice and a cool, crunchy purple cabbage sesame slaw. 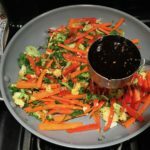 Serve with a Garlic Honey Soy Sauce....YUM!!! 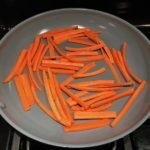 Slice the red pepper and the carrots thin. Slice thin or shred the brussel sprouts. Then mince the garlic and the ginger. Store the carrots and the garlic separate. You can store the red pepper, brussel sprouts, and ginger together. Shred the cooked turkey or chicken. Note, use whatever leftovers you have! If you don't have leftovers, you can buy a rotisserie chicken or simply roast turkey or chicken breast in the oven for 20 minutes in 400 F degrees. 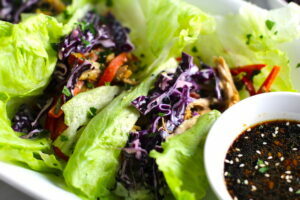 Clean and gently pull off the outer leaves of the lettuce. You will want 3-4 leaves per person. If the leaves are really large, you can cut them in half. Place in a large bowl lined with damp paper towels. Cover with another damp paper towel and then seal with plastic wrap or a lid. Make the rice according to package instructions. Next add the shredded turkey to the pan along with half of the sauce. 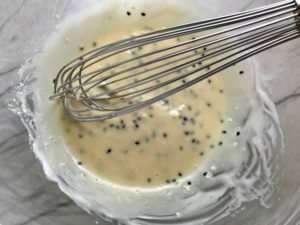 Stir to mix and cook for another 5 minutes until the sauce reduces. 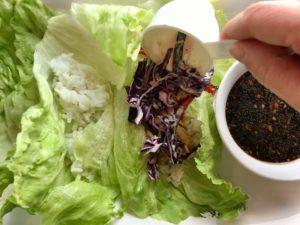 Put the remaining garlic soy sauce into individual dipping bowls and start to assemble the lettuce wraps. 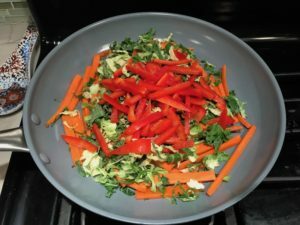 Layer in the rice, then the turkey and vegetable stir fry. 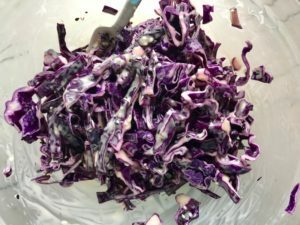 Last top with the cool cabbage slaw. Enjoy!